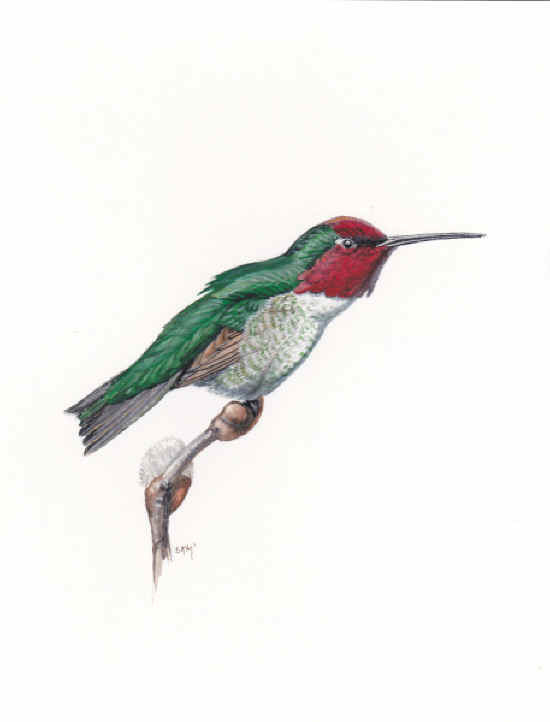 This little watercolour study was painted on paper, and shows one of North America’s better known hummingbird species, the Anna’s. They are found in all the Pacific coast states and provinces from British Columbia well into Mexico, and while they migrate from the northern part of that range, they can often be found in winter, even in snow, from British Columbia south deep into Mexico. They also often show up well to the east, all the way to the Atlantic coast, and along the Gulf coast. They love to visit gardens and hummingbird feeders, are quite abundant in the populace state of California, and are easy to identify, especially the males, who have magenta-red iridescent gorgets (throat feathers) and crowns.